Thiago Macedo shoves from the button and wins the blinds and antes. Christian Nilles is under the gun and he moves all in for 1,120,000. Daniel Strelitz calls from the button and the blinds fold. The board comes down , pairing Nilles' four on the river to score the double-up. Daniel Strelitz raises all in from the small blind and Thiago Macedo folds his big blind. Christian Nilles raises all in from the small blind for roughly 900,000 and Daniel Strelitz folds his big blind. Daniel Strelitz raises to 340,000 from under the gun, Ankush Mandavia reraises all in from the small blind with the bigger stack, and Strelitz folds. Ankush Mandavia receives a walk in the big blind. Ankush Mandavia limps from the button and Daniel Strelitz checks his option. The flop is and Strelitz checks. Mandavia bets 175,000, Strelitz check-raises to about 450,000, and Mandavia folds. Ankush Mandavia raises all in from the small blind and Christian Nilles folds his big blind. Pedro Oliveira moves all in for 1,195,000 from the cutoff and Daniel Strelitz moves all in over the top from the button. The blinds fold and the hands are tabled with Oliveira at risk. The board falls , keeping Strelitz's ace-high in the lead to eliminate Oliveira from play. Daniel Strelitz moves all in from the small blind and takes down the pot preflop. Ankush Mandavia limps from the cutoff and Christian Nilles three-bet shoves from the button. The blinds fold and Mandavia follows suit. Thiago Macedo moves all in from the button and wins the blinds and antes. Ankush Mandavia raises to 300,000 from the small blind and takes down the pot preflop. Thiago Macedo raises all in for roughly 1,350,000 from the small blind and Ankush Mandavia folds his big blind. Ankush Mandavia raises to 250,000 from under the gun and wins the blinds and antes again. Ankush Mandavia raises to 250,000 from the cutoff and wins the blinds and antes. 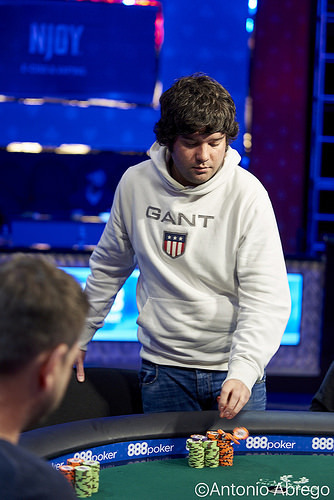 Daniel Strelitz raises to 250,000 from under the gun and Ankush Mandavia calls from the button. The flop is and Strelitz checks to Mandavia, who bets 150,000. Strelitz calls. The turn is the and Strelitz checks again. Mandavia bets 400,000 and Strelitz folds. Pedro Oliveira raises to 250,000 from under the gun and gets no action.